Do you need extra help for EL students? 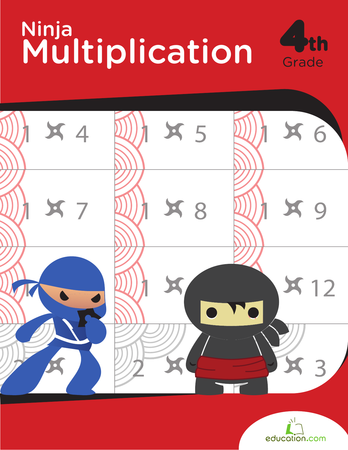 Try the The Lattice Method for Multiplication pre-lesson. Find interactive books for each child’s level. Students will be able to multiply two two-digit numbers using strategies based on place value and properties of operations. The adjustment to the whole group lesson is a modification to differentiate for children who are English learners. Gather the students together in a group. 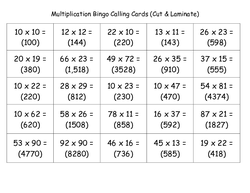 Explain to the students that they will be playing multiplication bingo, where they find the product of two numbers by adding groups of numbers together. Ask a student to explain the rules of bingo. Student explanations should include that they need to get five answers in a row before calling bingo. Answers can be found vertically, horizontally, or diagonally. Make sure students touch upon the role of the free space as well. Provide student-friendly definitions of the following words in students' home languages (L1) and in English (L1): "horizontal," "vertical," "diagonal," "bingo," "multiply." If possible, include pictures or examples to make the definitions clearer. Have students discuss the rules of bingo with a supportive partner before sharing their knowledge with the whole group. Provide sentence stems to help students describe the game: "To play bingo, you have to... To win bingo, you have to..."
Write a two-digit by two-digit multiplication problem on the board. For example, 13 x 11 or 15 x 10. Write the problem vertically. Model solving the problem using a few different methods. 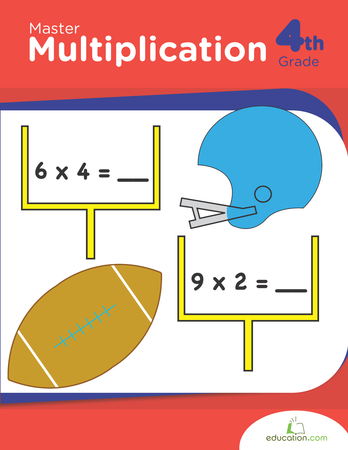 Some methods may include traditional, lattice, illustrations, repeated addition, etc. 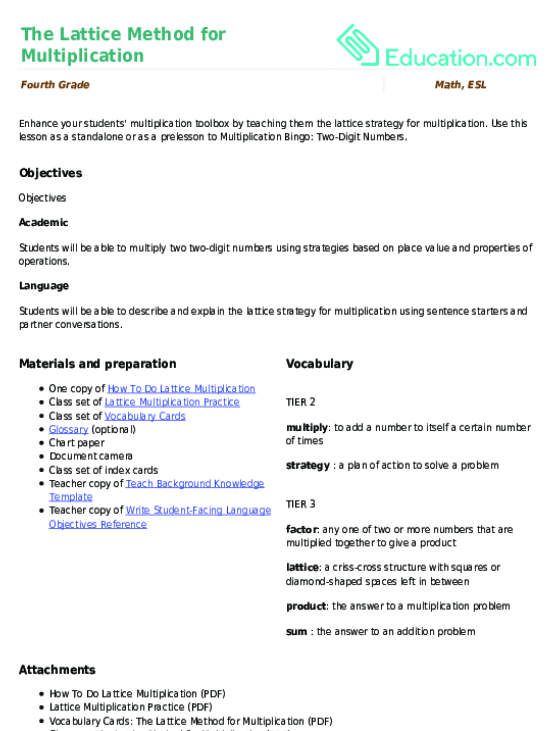 Write out the steps and read them aloud as you solve the multiplication problems using various strategies. 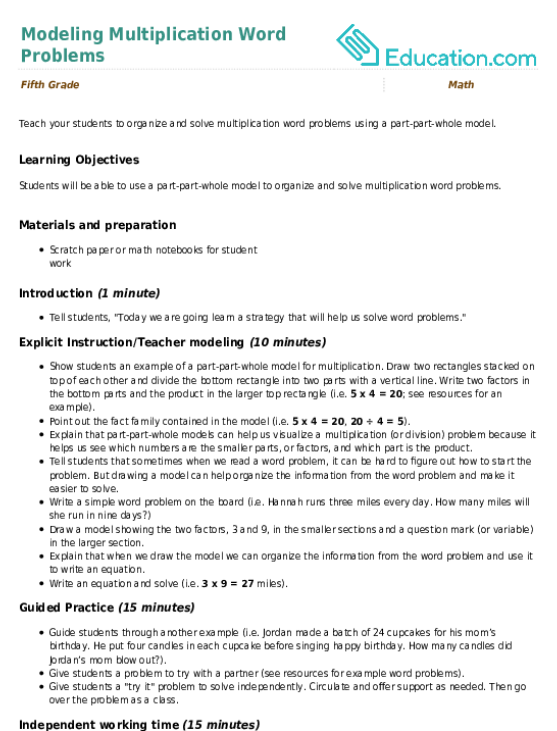 Include symbols or images along with the written steps. Create a word/phrase bank with pertinent terms that will help students understand the multiple strategies to multiply. Give examples in the word/phrase bank to aide in students' understanding. Have students repeat or rephrase to a partner the steps you take to solve the problem. Write another two-digit by two-digit multiplication problem on the board. Ask the students how they would solve the problem. Allow a few students to come up to the board to share strategies they would use to solve the problem. Student strategies may include illustrations, equations, the lattice method, arrays, or area models. Explain to the students that they will each have a whiteboard and a marker to solve the multiplication problems. Provide transition words to help students explain their solution (First... Then... Finally...). Give students a chance to discuss the problem with a partner. Provide a sentence frame to help students explain how they would solve the problem: "I would solve this problem with the ____ strategy because..."
Pass out the bingo boards, whiteboards, and markers. Pick up a card, and read the equation. For example, "What is ten times ten?" Write the equation on the board. Give students a few minutes to solve the equation. Call on a student to give the answer. If the answer is correct, write the answer on the board. If the answer is not correct, help the student to solve the problem correctly. Students should find the answer on their boards and cover it with a counter. Continue calling out the equations until a student calls bingo. Allow students to share one bingo card with a partner and have them work collaboratively to solve the multiplication problem. Let students compare and check their answers with a partner before moving on to the next problem. Have your students pair up, and ask them to take turns answering the problems. If students solve the problems quickly and accurately, challenge them by asking them to fill their entire boards before calling bingo. Observe students as they solve the problems using their whiteboards. Instruct students to repeat the instructions of the bingo activity to a partner. Have students verbally describe the strategy they used to solve the problem by displaying their work on the document camera. Ask students to clean up their supplies. Gather the students together as a group. 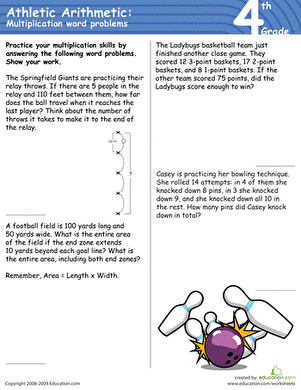 Ask the students to share the strategies they used to solve the problems. Potential guiding questions include: "Which problems were the trickiest to solve? How did you solve the problems?" Give students a sentence frame to guide them: "The problem that was trickiest for me to solve was ____ because..."
Have students discuss the prompts in a small group before participating in a whole class discussion. 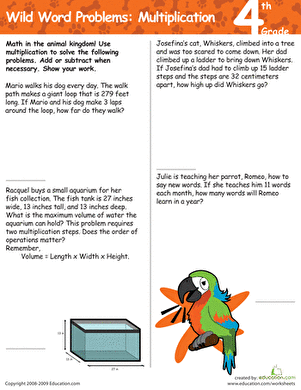 Teach your students to organize and solve multiplication word problems using a part-part-whole model.